During the Victorian period the problem of people who, through mental illness, could not play a full part in society, was to bury them in vast institutions, sometimes for life. A cluster were built in the South West of Hertfordshire, several to provide for people from the London/Middlesex area. 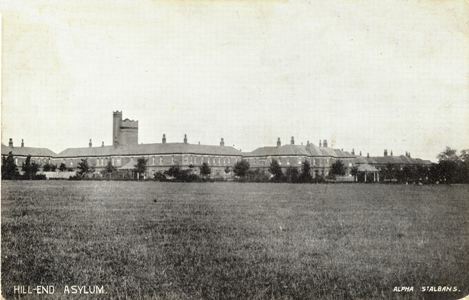 The Metropolitan Asylum for pauper imbeciles is a building of white brick, erected in 1869 and stands on elevated grounds about 4 miles from Watford; it will hold 2,000 and contains beds for 900 males and 1100 females, the cost per head for maintenance and clothing being 8d. per day and the cost per bed, including purchase of land, is £86 8s; the area devoted to the use of the institution is 85 acres, of which the buildings cover 18 acres. St Pancras Industrial Schools at Leavesden Woodland, near Watford, built in 1870, are for the reception of pauper children and have now 300 boys and above 300 girls and infants who receive a plain education and are subsequently sent out, the boys as apprentices, many of them entering the army and navy as musicians, while the girls are trained for and provided with places as domestic servants; the institution occupies a site of about 37 acres. Leavesden Hospital closed in 1995 - although specialist services remain on part of the site. Hill End Hospital, Hill End, St Albans, was founded in 1899 as the Hertfordshire County Mental Hospital and was finally closed in 1997. See Hill End Asylum for details. The first section of the hospital, to accommodate 1,046 patients, was commenced in July, 1931, and was formally opened by H.M. King George V, who was accompanied by Queen Mary, on the 31st May, 1934. The second section of the hospital was constructed in 1937 on the villa system, to bring the whole accommodation in the hospital up to 2,080 beds. Shenleybury Farm had been re-conditioned and largely rebuilt to serve the needs of the Hospital, and the mansion was re-conditioned in 1937 for use as a Convalescent Home for the patients. Medical Superintendent, G.W. Shore, O.B.E., M.D. Clerk & Steward, H. Hall. Clerk to the Sub-Committee, C.W. Radcliffe, Guildhall, Westminster, S W 1. The Middlesex Colony, begun in 1929, was opened on 20th May, 1936, by the Rt. Hon. Sir Kingsley Wood, M.P. Minister of Health. The Colony is intended for mental defectives who are socially inadaptable in the community, or who are neglected or without visible means of support. Male defectives who are capable of being employed are provided with suitable agricultural occupations on the land, or at various industrial occupations in the Colony's workshops. Female defectives are suitably employed in the laundry, general kitchen or workrooms. Children who are capable of it are given various simple occupations. The patients live in separate "homes" of the villa or pavilion type. The Administrative Centre, consisting of the main administrative offices, dental and surgical clinics, dispensary, central kitchen, reception hall, workshops, laundries, &c. has been built on an axial line running north and south, the Colony buildings for male and female being placed east and west around and overlooking playing fields. An isolated site on the south side is allocated for the children's section. The nurses' home is situated immediately to the west of the main administrative offices, adjacent to the main entrance from Harper Lane. Wild Farm, an 18th century house, is the residence of the medical superintendent: there are also residences for the Deputy Medical Superintendent and senior officers, and a staff village situated east on the road frontage forms part of the scheme. The Recreation Hall is equipped for talking pictures and has a stage; it will seat 700. There are tennis courts and sports grounds. The buildings are surrounded by farm lands. Medical Superintendent, H. E. Beasley M.B. The March 2005 of the Genealogists' Magazine records that the Society of Genealogists' Library holds a copy of Harperbury Hospital from colony to closure 1928-2001, by Kevin Brown. HALS has extensive records from Hill End Hospital, and some records for the other hospitals. The London/Middlesex based hospitals have records at the London Metropolitan Archives and sometimes elsewhere (see London Sources). A summary of the holdings of these, and other hospitals can be found on the Hospital Records Data Base. Only Harperbury is still an NHS hospital site, the rest having been redeveloped, although there are still be some specialist National Health Service facilities on some sites - such as the Eric Shepherd Unit at Leavesden. However many patients will still be alive, and "recent" patient records will not be accessible and could be held by the successor NHS organisation. Because of changes in NHS Trust structure some of the locations given for some records (which may include confidential patient records) are incorrect. For instance the Horizon Trust is no longer in existence, and its successor trust is the Hertfordshire Partnership Foundation Trust. Burial of hospital inmates: It is important to realise that the large mental health hospitals were set up by the Poor Law Unions, to be a more appropriate place to hold the mentally ill paupers than the workhouse. At least in their early days a patient dying in one of the hospitals would get a pauper's burial in an unmarked grave, and I believe that in many cases this would be in a graveyard somewhere in the hospital grounds, possibly close to the hospital chapel. Anyone trying to obtain more information should start by contacting the Records Office holding the surviving hospital records (see above). The July 2007 issue of Family Tree Magazine had an interesting article entitled Lunatic Ancestors - Inmates of the asylums. In particular it draws attention to the National Archives record class MH94 which lists all persons admitted to county asylums between 1846 and 1957. The article also identifies a number of useful web sites including www.countyasylums.com - which includes pictures of several of the above - under Hertfordshire and Middlesex. 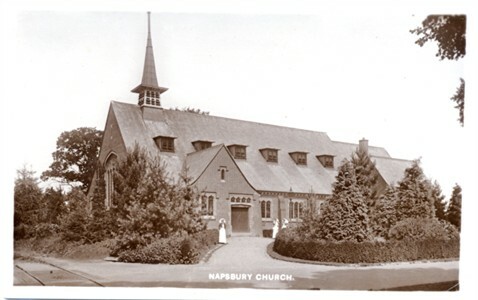 NOTE: Some of the hospitals, in whole or part, such as Napsbury, were used as military hospitals during the First World War. Military Hospital patients may well not have been recorded in the asylum records, but rather in military records. This Asylum covered Bedfordshire, Huntingdonshire and Hertfordshire until Hill End Hospital was opened. Revised edition published by Hertfordshire Publications in 2017. Yesterday I attended the "Herts and Minds" evening at HALS and was impressed by the range of original documents relating to mental heath in the Hertfordshire county archives. I was interested to see the case notes of early Hill End Asylum patients and the deaths register. I noted the burial details of Emily Evans, whose tombstone I had recorded on the page about old asylum cemetery - and it appears that the first few patients who died in the asylum had grave stones - but later patients had more economic burials. However, despite the wealth of material on display the message I left with the impression that for many of the mentally ill of the past very few records remain. In addition to the documents on display there was a very informative series of display panels on the history of mental illness in Hertfordshire over the centuries. They will remain at HALS until the end of next week, but it is planned to make them available on the Out of Sight, Out of Mind web site. (this site has greatly improved since I last visited it.) There was also a very informative booklet about the Out of Sight, Out of Mind project - and the map showing the five St Albans Asylums is taken from this booklet. The booklet is interesting for its honesty in that it looks at the various events in the history of the project and for each identifies "What worked", "What could have gone better" and "Special moment".